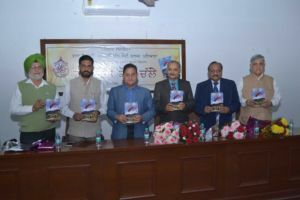 The book entitled ‘Naal Mere Koi Challe’, a travelogue, by Principal Khushvinder Kumar was released today at M. M. Modi College, Patiala. More than 100 intellectuals, writers and critics took part in the deliberations. Dr. Rajnish Bahadur, Former General Secretary, Kendri Punjabi Lekhak Sabha delivered the keynote address and observed that Dr. Khushvinder Kumar’s travelogue revolves around the life of common men. Simplicity of language and spontaneity are the features of his writing. He further said that it is worth appreciating that Dr. Kumar has chosen to travel various regions of his own country and write about his own people. Dr. Gurdeep Singh, Head, Department of Punjabi welcomed the dignitaries and Prof. Gurmukh Singh Sehgal mesmerized the audience by the wonderful musical rendition of Shah Hussain’s poetry. Dr. Harcharan Singh highlighted various aspects of the book which include various travels by Dr. Khushvinder Kumar. He further said that Dr. Kumar is a well travelled person, who has explored J&K in the north, Assam in the east, Bombay Goa in the West and upto Kanyakumari in the south. His book will serve as a guide for the people who seek to know the soul of India through traveling. Dr. Khushvinder Kumar spoke about his creative process. He laid emphasis on the social and environmental concerns along with the life of common man. The chief guest Prof. Surindra Lal, Member College Managing Committee congratulated Dr. Kumar and appreciated his creative writing. Prof. Tarsem Bahia in his presidential remarks said that traveling has a significant role in the development of civilization and writing of the history. He further said that in this travelogue, we have a glimpse of incredible India. The guest of honour Dr. Deepak Manmohan also appreciated the book and said that the writer’s innocence is reflected throughout the pages of this book. The other eminent persons who presented their views on the occasion include Principal Surinder Sanga, Dr. Kuldeep Puri, Principal Trilok Bandhu, Dr. Jaspal Singh, Principal Navtej Sharma, Dr. Baljinder Nasrali, Principal Jaspreet Kaur, Dr. Kulwant Singh, Sh. Satish Gulati and Prof. Bawa Singh. Prof. Balvir Singh conducted the stage and Prof. Vaneet Kaur proposed the vote of thanks.